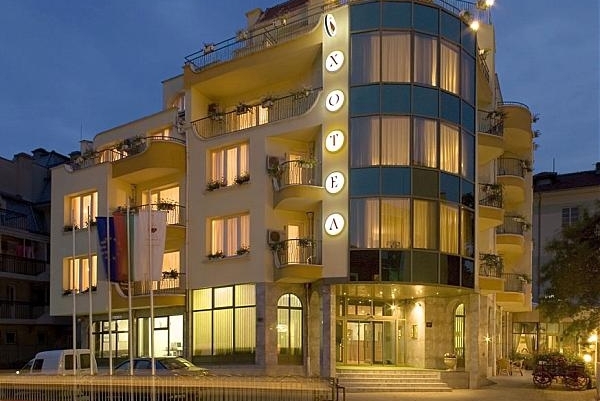 Location: Best Western Bistra & Galina hotel complex is located in a quiet downtown street in the city centre of Rousse. The hotel complex is winner of several international awards for quality in the hospitality industry. Accommodation: total 70 beds allocated in 2 suites, 2 studios, 27 double and 8 single rooms, disposed in two buildings - southern and northern. The new northern building has 2 studios, 6 de luxe double and 1 single rooms distributed on floors for smokers and non-smokers. Each room is equiped with unique furnishings, air-conditioning, minibar, cable TV, individual Internet access, bathroom with tub. The southern building has 2 suites with winter garden, 21 double and 6 single rooms distributed on floors for smokers and non-smokers. Each room is furnished with air-conditioning, minibar, cable TV, phone. In the hotel: Main restaurant with 46 seats and summer garden with 40 seats, conference hall with 70 seats, equipped with modern audio technics, mobile computer, multimedia projector, flipchart. The new Recreation centre situated in the northern building of the complex. The guests can avail of the modern facilities for maintaining a good physical condition, preventive and healing procedures with the help of well-trained specialists. It offers steam bath, vertical turbo solarium, infrared cabin, fitness centre, swimming pool with Jacuzzi, massages.